Cartoon by Phil Hands, editorial cartoonist for the Wisconsin State Journal. (by Carleton English, New York Post) – …Federal regulators on Wednesday, in the largest e-cigarette enforcement action ever, said it may ban the sale of flavored vaping cartridges. The move is aimed at stemming the number of teens who vape — and stopping stores that sell the popular e-cigarettes to minors. “We see clear signs that youth use of electronic cigarettes has reached an epidemic proportion,” Food and Drug Administration Commissioner Scott Gottlieb said. The FDA put Juul Labs and four other manufacturers of flavored electronic cigarettes on notice that their products could be yanked from the shelves if they don’t address rampant use by underage nicotine addicts. The five manufacturers, who make up 97 percent of the US market, have 60 days to submit [convincing plans for reducing teen use] to show they’re combatting the problem. The FDA admitted that making some vaping products harder to find might stop some adults from weaning themselves off regular cigarettes. “It’s now clear to me, that in closing the on-ramp to kids, we’re going to have to narrow the off-ramp for adults who want to migrate off combustible tobacco and onto e-cigs,” Gottlieb said in a statement. [In 2017, 2.1 million middle- and high-school students had used e-cigarettes in the past 30 days, according to a federal study. Dr. Gottlieb said 2018 data showed much higher usage, but declined to disclose the figures. Just a year ago, Gottlieb, a former board member of e-cigarette retailer Kure Corp., said that the FDA should be open to noncombustible nicotine products. “We need to make sure we strike the right balance between FDA fulfilling its vital consumer protection role while also fostering innovation when it comes to potentially less harmful forms of nicotine delivery,” Gottlieb said in July 2017. 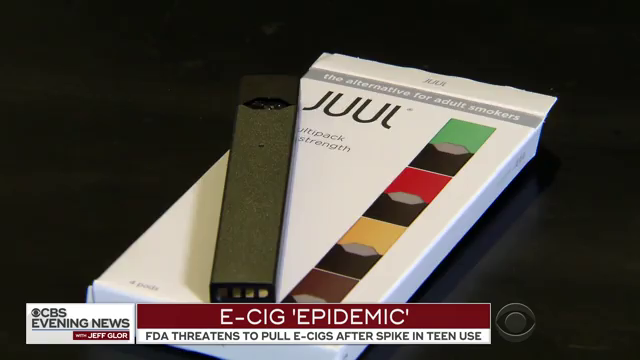 Juul, which sells mango- and cucumber-flavored pods, said Wednesday that it will work with the FDA to prevent access to minors. It said flavored e-cigs aren’t aimed at kids. “Appropriate flavors play an important role in helping adult smokers switch. By working together, we believe we can help adult smokers while preventing access to minors,” Juul said. Parents and government officials across the country have been working to ban flavors and prevent sales of products near schools. In addition to targeting manufacturers, the FDA sent warning letters to more than 1,100 retailers that illegally sold minors e-cigs. An additional 131 retailers face civil monetary penalties. ….. NOTE: Before answering the questions, watch the CBS News report under “Resources” below. 2. What is the aim of the action the FDA announced on Wednesday? 3. In 2016 the former FDA head gave a grace period to e-cigs manufacturers for those already on the market. Last year, new FDA head Dr. Scott Gottlieb extended that grace period to 2022, allowing Juul and other manufacturers to continue selling their existing products. How did Dr. Gottlieb explain the FDA’s policy change? 4. a) What directive did the FDA give the manufacturers of e-cigarettes last week? 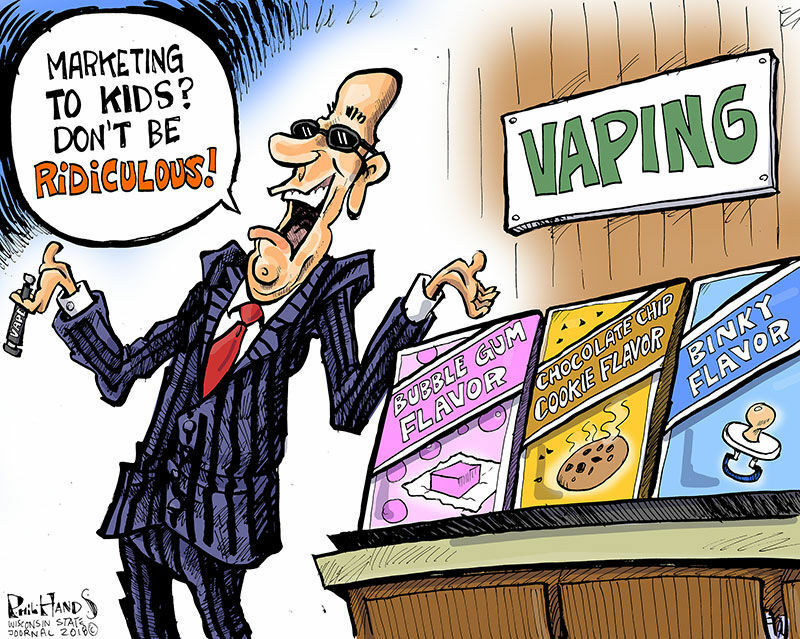 b) What step did the FDA take with retailers who sell e-cigs to minors? 5. a) How has Juul responded to the FDA and the problem with flavored e-cigs? b) What do you think of the company’s response? Do you think they are sincere or disingenuous? Explain your answer. 6. What have parents and government officials across the country been trying to do? a) Do you think Juul and other manufacturers market flavored e-cigs to teens, or are they only aimed at adults trying to quit smoking? b) Should flavored e-cigarettes be banned completely? c) If reports showed that vaping was dangerous to your health, would you still vape or try vaping? f) Do you think its ok for middle school students (6th graders) to vape? d) A study in Colorado showed that about 27 percent of high schoolers vape. What is the best way to get teens to stop vaping? e) In the 1940s and 50s cigarette ads glamorized/popularized smoking cigarettes. The link to lung cancer was not publicized until the late 50s. E-cigarettes are marketed as a less harmful alternatives to smoking. But there does not appear to be much data yet on if there are long term health effects. Some people say it’s bad to smoke, but not to vape. What do you think? Does it matter what you put into your lungs? Can vaping be 100% harmless? One group not crying over the FDA’s action is big tobacco. Stocks of cigarette manufacturers — even those that also make smokeless products and were part of the FDA’s action — soared after getting a whiff that competitive e-cigarettes would face tighter regulatory scrutiny. Altria Group, maker of Marlboro as well as the MarkTen XL e-cig, gained an ominous 6.7 percent Wednesday, to $63.43. Shares of other cigarette manufacturers were also set ablaze, with British American Tobacco soaring 6 percent and Philip Morris International popping 3.4 percent. E-cigarettes have been a money-loser for big tobacco companies that entered the business. “Any immediate regulatory action would have minimal financial consequences on the companies — it would actually be accretive to earnings,” Stifel analyst Christopher Growe said. Read previous articles on vaping posted at StudentNewsDaily.